Expecting Channel Partners to prospect for new business? A realistic expectation? Home → Uncategorized → Do you expect your Channel Partners to prospect for new business? 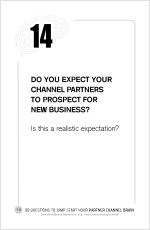 Do you expect Channel Partners to prospect for new business? “Dear [LinkedIn #1 connection], I want to introduce you to a guy I [barely] know for the __________ position at your company. His [professionally coiffed] profile seems to match your [unrealistic, messiah-sounding] job listing perfectly. I would never actually send this email. But if you’re one of those people Malcolm Gladwell calls “Connectors” then you recognize the thinly disguised, slightly veiled request to pimp your list. You build relationships, play matchmaker, keep everyone’s interest front and center and because of this, have one heck of a nice Rolodex. Over time, however, you’ve learned the hard way that all introductions don’t work out. And despite the fact that you’re offering no guarantees (aka caveat emptor/caveat venditor), when things go south it’s not unusual for one or both parties to complain loudly… to you, the go-between. Because of this, I’ve learned to be much more cautious with my introductions. I don’t want to risk any of the relational capital I’ve built over the years because of some screw-up on behalf of a person who failed to show up for an interview or propositioned the owner’s spouse (yes, these occurred, among many other professional gaffes). Are you asking Channel Partners to Pimp Their Lists? The reason I bring this up should be obvious. Your Channel Partners have invested a great deal of relational capital in their business contacts. Every time you ask them to bring you into an account—especially if you’re the new kid on the line card—there’s a certain amount of relational or career risk at stake (for them, not for you). Your #1 job is to mitigate the risk…whatever the nature of risk, be it Relational Risk, Career Risk or Account Risk. Generally, mitigating risk requires that you to make an offer, a promise or a guarantee that is literally impossible to refuse. In 1982 I was calling on machine tools manufacturer Giddings & Lewis in Milwaukee. They had already selected Motorola (my arch enemy) for their microprocessor. But Motorola wasn’t nearly as hungry as I was. Their local support guys dropped off the face of the earth, having sold about $25,000 in development systems gear to G&L. It was a nice account win for Motorola, but there would never be much production volume. I overwhelmed the Giddings & Lewis engineering team with support. I brought in application engineers from our local Milwaukee office, our regional office in Chicago, as well as app engineers from our headquarters in Santa Clara, Calif. and Chandler, Ariz. The client was impressed and really wanted to make a switch to Intel. 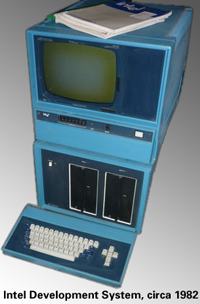 Only one problem: the engineering manager had this $25k Motorola Development System. He had no way to explain the Motorola boat anchor to his boss (the VP Engineering). This is Career Risk. Somehow, vendors have to remove this risk. So what did I do? I called Don Latour, the marketing manager for our development systems division and offered him something I knew he wanted: a Motorola Development System. He was thirsty for factual, competitive g2. We made the swap, Giddings & Lewis became an Intel account win, Don Latour got his system (and had the title transferred to a friendly engineering firm so he could legitimately receive all the product updates) and I got quota credit for the sale, thanks for my boss, Bill Roach, who convinced the Intel bean counters to recognize the deal as a legitmate sale. Challenge: Get creative and mitigate relational risk for your Channel Partners so they may prospect with confidence.